When my brother-in-law asked me if I'd make an album for his sister-in-law for Christmas, I have to admit that I took it as a big compliment! His brother adn sister-in-law are expecting a baby girl, but didn't have a name picked out. I kept the album really simple and tried to work with a size that would allow for uncropped 4x6 prints. I used a tabbed Scenic Route chipboard album that was already "covered" in grid paper to keep things extra simple on my end. 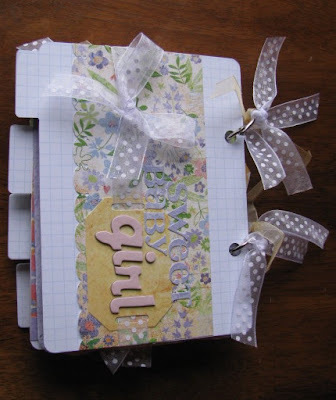 I chose the Basic Grey "Oh Baby Girl" paper line and added "girl" in pink chipboard Thickers, some ribbon, buttons, and flowers. The chipboard album I used, was only four chipboard pages. To expand the album, I took solid Basic Grey papers and folded them in half and adhered the two sides together to make a stiffer page. The large flowers you see are actually folded around the solid pages to accent both sides of the page. I used a BG tag for every page that they can use to journal about the photos they choose to include in the album. My sister and brother-in-law were very pleased with the results and told me the recipient was also. :) The whole project took me just over two hours to finish. Another great gift! Sooo CUTE! I love this album Amy!! You do great with girly stuff too! Always inspired!